Ok I thought about going down to Texas to do a 100k race, but with the same distance race in my backyard who needs to go that far south. 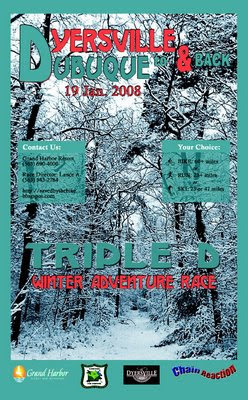 This is the Triple D slated for January 19th, a 60 mile round trip race from Dubuque to Dyersville, Iowa and back. Everything you need to know about this race is located at Lance Andre's site, so go check it out. 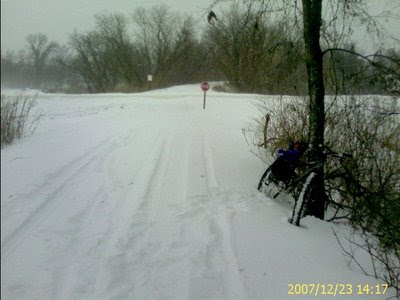 Some pics from Lance's site, this should be very interesting in deed, now the question single or geared, lots of snow means single, but big tail winds on the return warrants some gears, decisions, decisions. I guess I could always ski it. I read that Lance was actually pushing his bike down some of the hills, ugh that would be a first for me. 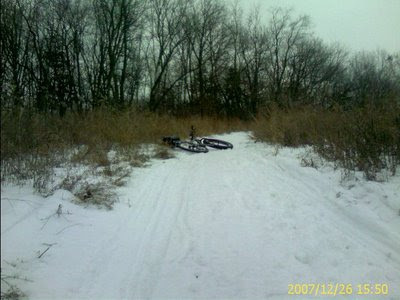 I better start looking for some studded 29er tires, I bet that will be easy to find. Thanks Lee for the race plug. I rode one of the options last night (the entire course 57 miles) it took me about 7 hours (this included a 30 minute stop at a local bar for fuel). This option would be one of the hardest as there were no roads involved what so ever (all trails). I wouldn’t take the wind into account at all, as most of the sections that I’ll be utilizing will be sheltered. A low geared single will do nicely. Also, studs will be a waste on weight and may only help you for 50’ or so… WIDE is what you’ll want, as wide as your bike can fit.